"It also begs the question, what kind of self-declared democratic government, suspends the right of the people to have their say at the polls?” “Leo Varadkar would not tolerate discrimination against the LGBT community, women, victims and Irish speakers in Dublin. He should not tolerate it in Belfast either." 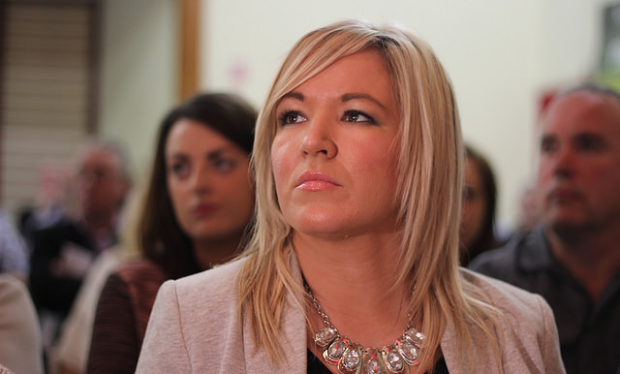 The correct decision by British Secretary of State Karen Bradley to reduce MLA wages cannot be allowed to mask the true nature of the undemocratic and politically damaging measures she announced in recent days. By her own staggering admission, Karen Bradley did not understand the voting motivations of the electorate here when she first took up the post. Clearly that is no longer the case. But unfortunately for anyone in this society who is interested in the rights of citizens, equality or the implementation of previous agreements, there is only one set of votes that Karen Bradley is interested in – and that is the DUP’s. Her government is reliant on the DUP for its own survival and is clearly determined not to upset that applecart, no matter how rotten its contents may be. She had an opportunity this week to take tangible measures that would have helped pave the way for a restoration of the power-sharing institutions by confronting the ongoing denial of rights by the DUP. But despite championing rights and equality in her own constituency and country, she failed to do so on behalf of citizens here. Instead what she announced was a suite of measures which subvert the democratic process and previous agreements. Faced with the prospect of a court-ordered Assembly poll, she moved to suspend her powers to call an election as set out in the legislation. That is a hugely retrograde step and a move away from the Good Friday Agreement. It also begs the question, what kind of self-declared democratic government, suspends the right of the people to have their say at the polls? And while we all accept that officials require clarity on their roles in the current climate, any move to replace democratic accountability with greater authority for unelected civil servants or Direct Rule Ministers is entirely unacceptable. The aim of Karen Bradley’s intervention this week, setting aside the convenient timing of distracting from explosive evidence at the RHI Inquiry, was to buy time. To announce a flurry of supposed activity but, in reality, doing nothing but continuing to facilitate the denial of rights which is preventing a restoration of the power-sharing institutions. Her government is prepared to allow the political process to continue to drift with no strategy and no plan for a resolution rather than challenge their confidence and supply partners. This reliance on the DUP remains the central problem and if any process around restoring the institutions is to be credible, Karen Bradley must begin prioritising the rights of citizens over Tory party self-interest. The Dublin Government must also assert its full role as a co-guarantor of the Good Friday Agreement. The Taoiseach has pledged not to abandon northern citizens in the context of Brexit. He also has responsibilities to them in terms of rights and his government and must now show leader-ship in securing and defending rights which are routinely delivered everywhere else on this is-land. Leo Varadkar would not tolerate discrimination against the LGBT community, women, victims and Irish speakers in Dublin. He should not tolerate it in Belfast either. There can be no ambivalence or equivocation on rights, equality and integrity in government. These are basic building blocks of any democratic society. They are not republican demands and it is long past that the British Government stopped prioritising its own selfish interests over what should be birth-rights of people they claim to represent. What is certain is that Direct Rule failed in the past and is not and never will be acceptable again.